Slate Office owns a portfolio of office properties primarily in Ontario, Atlantic Canada, and Illinois. Slate Office recently cut its dividend by 47% in order to free up some cash to delever its balance sheet. Slate Office pays a 6.6%-yielding dividend. 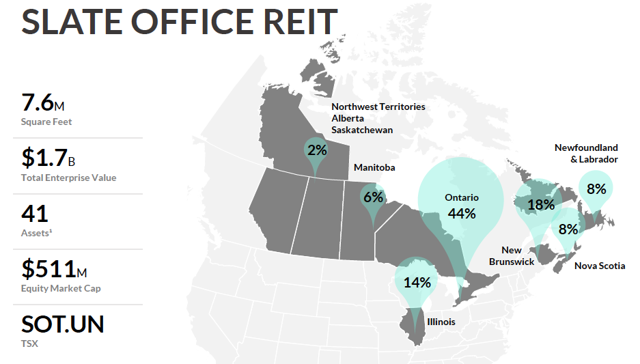 Slate Office REIT (OTC:SLTTF) (TSX:SOT.UN) delivered solid Q4 2018 result with strong same property net operating income growth. However, its high leverage has forced the company to cut its dividend by 47% and sell some of its properties. Despite these moves, we think it may still take several years for the company’s balance sheet to return to an acceptable level. Therefore, we recommend investors to remain on the sideline and seek opportunities elsewhere. Slate Office posted strong growth in its Q4 2018 earnings. As can be seen from the table below, its SPNOI increased by 14.5% thanks to rental rate increases on renewals and new leasing. 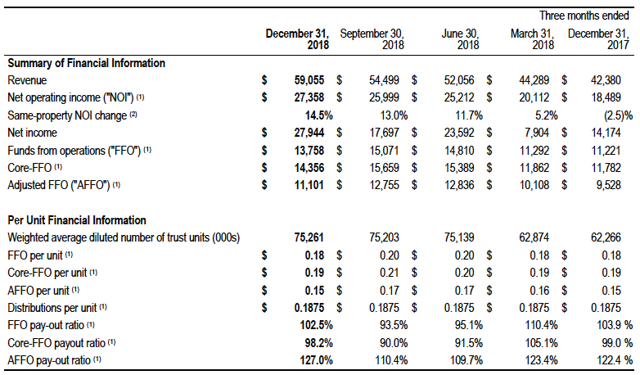 However, its funds from operations per share was only C$0.18 per share in Q4 2018. This was lower than Q3 2018’s C$0.20 per share. This was mainly due to higher interest expenses. In Slate Office’s latest earnings release, the REIT announced a cut to its dividend by 47%. This has resulted in a reduction of its annualized dividend from C$0.75 per share to C$0.40 per share. Slate Office’s new dividend represents a payout ratio of about 60% (based on its 2018 FFO). This is much lower than the payout ratio of 99.6% before the dividend cut. Slate Office’s dividend cut will allow it to preserve the cash and use it to repay debt and improve its balance sheet. For readers’ information, Slate Office’s debt to gross book value in 2018 was 63%. With a dividend cut, its balance sheet should gradually improve and its debt to GBV ratio should gradually return to the mid-50% range in the next 2~3 years. Besides the dividend cut, Slate Office is also in the midst of selling some non-core assets. In Q4 2018, the company sold two properties for C$42.3 million in Toronto. Its 225 Duncan Mill Road property in Toronto was also sold in Q1 2019 for C$22.3 million. Slate Office also announced in Q1 2019 it will sell a 25% interest in a portfolio of 6 Toronto office assets for C$131.8 million. These dispositions should help it to improve its leverage and/or recycle the capital towards other higher growth properties. About 83% of Slate Office’s pro forma gross leasable area are located in the Greater Toronto Area. This region continues to benefit from limited supply, especially in the downtown Toronto area owing to strong demand for office space from co-working and tech tenants. In fact, office vacancy rate in downtown Toronto sank to only 1.8% in Q2 2018. As can be seen from the chart below, downtown office average net rent has skyrocketed in 2018 to near C$36 per square feet. This should support Slate Office’s rental revenue growth in the GTA. Thanks to strong demand for office space in its major markets, Slate Office should be able to renew its leases at a much higher rental rate. As can be seen from the table below, weighted average new rent of C$17.88 per square feet is much higher than the average expiring rent of C$16.09 per square feet. This represented an increase of 11.1%. The strong demand in markets such as Greater Toronto should help it to grow its average rental rate in 2019. Slate Office currently trades at a price to 2018 adjusted FFO of 9.3x. This is much lower than Allied Properties’ (OTCPK:APYRF) P/AFFO ratio of 27.0x and Dream Office’s (OTC:DRETF) 20.0x. Slate Office's current price of C$6.03 per share is significantly below its net asset value of C$8.55 per share. Slate Office offers a monthly dividend of C$0.03333 per share. This is equivalent to a dividend yield of 6.6%. Thanks to a dividend cut announced in March 2019, Slate Office’s dividend is safe with a dividend payout ratio of about 60%. While demand for office properties remains robust, in an economic downturn, demand for office space can diminish quickly. If such condition happens, it may impact Slate Office’s occupancy rate and rental revenue negatively. Although Slate Office is in the midst of deleveraging its balance sheet, its debt is still quite elevated. This means that in a rising interest rate environment, the company may have to refinance its mortgages with higher interest rates. This will result in higher interest expenses and negatively impact its bottom line. Management still plans to sell some more non-core assets in 2019. This means that any disposition of its non-core properties may result in a temporary loss in rental revenue until the capital is re-invested towards new properties. We like the actions management have made to improve Slate Office’s outlook. However, we recognize that it will require several years for the REIT’s balance sheet to return to a level that we are comfortable with. We prefer debt to GBV ratio to be below mid-50% range. Despite its attractive valuation, we think investors may want to seek opportunities elsewhere.